Please read this entire page. 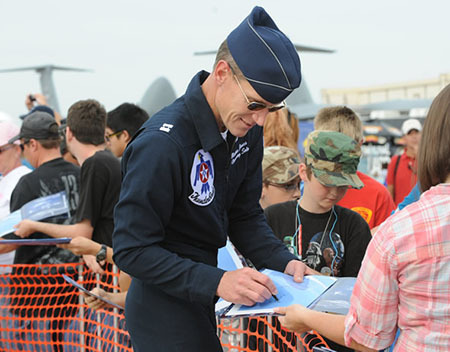 It includes critical information about the Thunderbirds and upcoming VIP Ticket Launch. It’s official! The USAF Thunderbirds are back to flying air shows and “GO!” for the 2018 Thunder of Niagara International Air Show on June 9 & 10th. 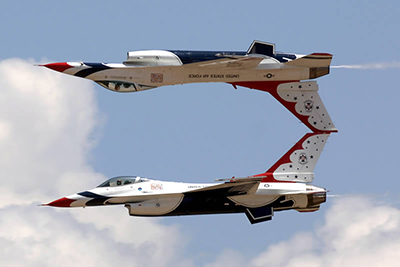 They announced their return to air show flying via their website and Facebook page. GO VIP and Get Up-Close to ALL the Heart-Pounding Aviation Action! Here’s the bottom-line … The most heart-pounding/spine-tingling action takes place at the airfield. Nothing else comes close! Simply put . . . you won’t see the action in the picture above from the backyard or side of the road. Go where the action is in MAX afterburner >>> AT THE AIRSHOW! VIP Tickets Launch this Thursday, May 17th at Noon Eastern Time! Go VIP and experience the air show in an extraordinary way! Below are the two VIP ticket packages offered for the 2018 Thunder of Niagara International Air Show at the Niagara Air Reserve Station, Niagara Falls, New York. Only Insiders Get up to 50% OFF* VIP Tickets at Launch! As an Insider, you get up to 50% OFF and first dibs on VIP tickets (not available to the public). Deep discount pricing expires Monday, June 5th at 12:00 PM noon Eastern Time OR when limited launch quantities are reached. After that, prices will go up. *Nominal ticket fees may apply. Watch the Air Show – In Comfort, from a Prime Viewing Location … Get Up Close to the Action!!! WHEN do Discount VIP Tickets Go On Sale? VIP Tickets Go on sale this Thursday, May 17th at 12:00 PM (Noon) ET. If any VIP tickets remain, they will go on sale to the public on Monday, May 21st at 12:00 PM ET. All VIP ticket prices will increase on May 21st and at the end of each week. WHERE do Discount VIP Tickets Go On Sale? Discount VIP tickets can be purchased securely online, using an Insider Only Link. ONLY Air Show Insider will receive a unique purchase opportunity via email on Thursday, May 15th at 12:00 PM (Noon) Eastern Time. You will then be able to buy and print your VIP ticket(s) from the comfort of your home or office. All discount VIP Ticket purchases are online ONLY using most major credit cards. Please Don’t Wait – Only 1,000 VIP Tickets Available! Only 1,000 VIP tickets will be available for sale. Please don’t wait to buy tickets – in 2015 Saturday Flight Deck tickets SOLD OUT in 2 days! Once all 1,000 VIP tickets are sold out, VIP tickets sales will close. We want to ensure our VIP’s have the most comfortable and premium experience possible. There are massive upgrades being made to Niagara’s 2018 VIP Experience (both figuratively and literally). This includes the areas of comfort and shade, food, plus beverage selection. As a result, VIP prices will increase from 2015. Full pricing details will be released on Thursday. As a friendly reminder, general admission to the air show and parking are FREE of charge. You do not need to pay anything to attend the air show. The VIP ticket packages represent an ULTRA-PREMIUM level air show experience and are entirely optional. Insider ONLY Price: TBD, per person, with an Insider Promo Code. This is your single best opportunity to meet, have your picture taken with, or get an autograph from some of the finest pilots in the world. Included in the 2018 Flight Deck VIP Experience is catered food and an open wine and beer bar, more details below. You get to sit comfortably in a hassle-free atmosphere without any crowds. 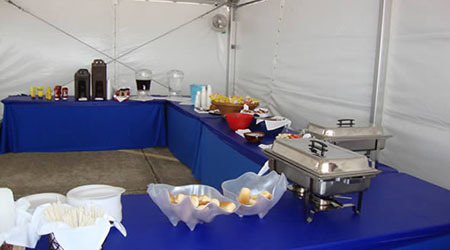 You Get Catered Food & Drinks! Your Chance to Meet Some of the Best Pilots in the World! As an Exclusive Thunder of Niagara Flight Deck VIP Ticket holder, you get . . .
Non-Alcoholic Beverages (Water & Soda) available all day at no-charge! Babes-in-Arms (2 years of age and younger) are granted FREE admission when accompanied by a ticket holding parent/guardian to the VIP Flight Deck. Because of the catering (per-person cost) and number of seats, no further discount is available for children. There might be a change to this on Thursday. No promises, but stay tuned for updates. We realize that the Flight Deck VIP Ticket is a premium price, but honestly believe it provides you with an aviation opportunity of a lifetime! You won’t be disappointed. You do not need to bring your own lawn chair or blanket, because we provide you with your own seat. The Preferred seating area will also have access to the high-end VIP bathrooms. 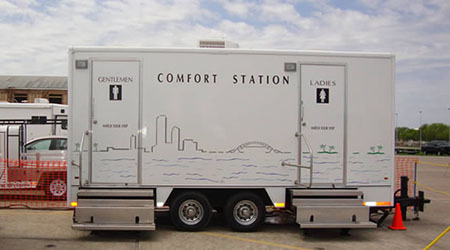 No more waiting in line for porta-potties. As an Preferred Seating VIP ticket holder, you get . . .
As most of you know, Niagara’s weather can be highly unpredictable, at best! When it comes to purchasing tickets … Please don’t rely on the weather forecast to help you make up your mind. Weather forecasting is a very challenging job and there are some great meteorologist. In our experience, “the forecast is not always reliable” for both good weather and bad. How many times have you seen a weather forecast that was completely wrong? Just because they forecast rain, doesn’t mean it’s going to rain! This leads to a very important point. Unfortunately, we cannot offer refunds on Flight Deck or Preferred Seating tickets. Rest assured, though, that the airshow is a rain-or-shine event. You should know that all performers have high, low and flat shows that can safely accommodate for different types of weather. There are also going to be some extraordinary static aircraft on the ground. Please note: Aircraft (especially military) are subject to operational requirements. If anything changes, we’ll let you know.